It’s been awhile since we last encountered Cecil Gant, the affable pianist and wheezy throated vocalist whose greatest contribution to rock’s story ironically came three years before rock itself even existed when his debut record, a longing ballad no less, proved that black music made for black audiences on tiny independent record labels had the commercial potential to make such endeavors economically worthwhile. With the success of I Wonder in 1944, a song that hit #2 on the Billboard Race Charts after being cut in a ramshackle garage for insignificant Gilt-Edge Records, Gant effectively opened the door to a generation of dreamers… artists and entrepreneurs alike… whose shared journey into the music business long dominated by the major companies who had dismissed them all out of hand became the very thing which soon threatened to upend the industry caste system. Though nobody realized it at the time Gant’s record had been a crucial turning point in the economic and cultural upheaval that was coming to fruition with rock ‘n’ roll. However when rock ‘n’ roll itself arrived – also with Gant’s inadvertent help via placing the phone call to DeLuxe Records chief Jules Braun in the middle of the night to have him listen to Roy Brown sing Good Rocking Tonight, which launched the entire movement singlehandedly – Cecil Gant was nowhere to be found, musically speaking that is. In the midst of drifting from one small label to another, churning out similarly sounding nondescript output from indeterminate stylistic categories, not quite cocktail blues (his gargling with glass voice was far too rough for that realm), not quite pop, certainly not jazz and for the most part far away from rock as well, Gant was at risk for fading back into obscurity. His train wreck of a personal life – unchecked alcoholism, no career management to speak of, unspecified medical issues which at times included having seeping open sores on his person, and his predilection for showing up at a recording studio with no material to speak of and sitting at the piano drinking until he made up a song on the spot which he’d be unable to ever duplicate, or even remember later – all conspired to make him one former hit-maker who was never a safe bet for lasting stardom. Yet in spite of all this Gant’s one big hit had been SO captivating that an entire generation of listeners were more or less willing to hand over their money each time they saw a new release with his name on it. Though that constituency wasn’t quite large enough to get him more than a few small hits through the years he rarely had any outright commercial flops, at least in regards to the expectations of the small labels he recorded for and so no matter what his personal flaws were Cecil Gant would always get more chances to revive his career. By 1948 and ’49 it was inevitable that he’d find his way to the outskirts of rock in an attempt to do so. Gant’s litany of problems described above certainly all contributed to his relatively lackluster showing in a career that began so full of promise. He was someone who was exceedingly competent at many different things – a fine piano player capable of laying down driving boogies and slower catchy rhythms; a songwriter who possessed a sharp eye when it came to coming up with interesting storylines and perspectives; and warm engaging singer even with a voice that always sounded in need of a steady supply of lozenges and warm tea with honey – yet he never seemed to be able to put all of these attributes together and turn out really great records when it came time to answer the bell. He’d give you all he had each time out, even the generic sides retained a notable charm, but he was incapable of delivering anything with polish and too often his inspiration wasn’t musical but rather financial. When the money ran dry that was when he ran in for another session, cutting songs that were but a means to an end. Unlike the growing competition, not just in rock but all forms of ever more solvent black musical styles at the time, Gant’s lack of professionalism when it came to crafting his work would always be his Achilles’ heel. But once again it never was a complete impediment to his sticking around. 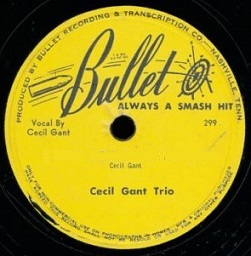 When his tentative forays into more rock-suitable material failed to connect, as we saw with Hogan’s Alley last spring and Cecil’s Jam Session in the fall of ’48, he simply turned right around and notched his final two hits with Another Day – Another Dollar and Special Delivery by aiming at a different listener. Neither one was exceptional, they both were somewhat ill-fitting in ANY specific genre, yet they appealed enough to someone to keep him in demand for awhile longer. Now he’s back with another stylistically indescribable song that we’ll awkwardly cram into the rock ledger if only to keep him from becoming TOO unfamiliar to readers who will need to know him when he finally – eventually – comes around and gives us a handful of pure rockers that will justify these earlier inclusions. The song in question today is called Screwy Boogie and if ever there were a title that was more appropriate for both the song and the performer it’s attached to I’d like to see it. Then again on second thought maybe I wouldn’t want to see it. This one is more than enough to cause my head to shake in bewilderment as it is, I’m not sure I could take one that was somehow even more incomprehensible. So oil your neck up in preparation for the shaking it’ll soon be in for and keep reading for the lowdown on this particular diversion. As stated earlier Gant’s approach to a recording session was to come in when he was in need of some cash, sit at the piano with tapes rolling and nursing a bottle of some kind and rack his brain for an idea. None of this was done with any contempt for the process, or spite for the company owner paying for the session. There was no begrudging sense of duty Gant felt he was being forced to submit to against his will, he just simply didn’t take the crafting of songs seriously because he’d simply never had to in his career. Remember, this was the guy who rose to sudden fame by doing just this – asking to play piano at a War Bonds rally in Los Angeles in 1944 and singing off the top of his head. When that off-the-cuff approach worked – as it had then – the results could be magical, but the rest of the time it was pretty much hit or miss. So his routine rarely changed in the studio – when he came up with an idea he’d let the engineer know and launch into it. One take was all you were going to get, he wouldn’t be able to retain what he’d thought up on the spot once he finished, so you took what he gave you and put it out as is, mistakes be damned. That’s one reason why so many of his songs featured spoken intros, almost as if he were trying to conceive of a story as he picked out the melody. It also helped to carve off a third of the playing time without really coming up with anything sensible, yet even then it often worked, giving the songs a personality they’d be lacking otherwise. Here Gant takes an even more minimalist approach, eschewing lyrics and spoken intros altogether and simply playing whatever comes to mind. Screwy Boogie is an instrumental featuring him alone at the piano. No other instruments are present and that’s a good thing because they’d be left scratching their heads, wondering where this was headed just as you the listener are. The thing about it is, Gant himself clearly doesn’t have any idea where it’s going either. His left plays a simple slow boogie pattern, never picking up or dropping the tempo until it sounds like a devious plot to lull you to sleep before you catch on to the fact he doesn’t actually have a song to sell you. His right hand is the one doing the thinking on its feet… or its fingers as it were. He’ll play a little riff, then pause while digging into his melodic memory bank to come up with the next brief refrain. It’s actually fairly amusing to hear him work this out as he goes along, picturing him half in the bag, concentrating intently, pulling out every gimmick he can without breaking the trance-like spell his unwavering left is offering. But is sounding relatively “amusing” going to be enough to sustain an entire side of a record? Will it be enough to justify asking 79 cents to buy, or even half that amount since the flip contains a languid ballad I Ain’t Gonna Cry Anymore that’s miles away from rock but might earn its thirty nine and a half cents for a spin or two. Obviously the answer is no. It’s interesting to hear, especially knowing his personal history and his lack of any preparation when it came to recording, and so this unusual attempt gives you something of a fly on the wall vantage point as he tries to keep it going as long as he can, but the finished result is decidedly lacking. In fact the whole thing is just an illusion. A slight of hand trick to get Bullet Records to think they just bought a song when all they bought was a routine warm-up exercise on the piano. It’s not played badly but it can’t possibly be played WELL because there’s absolutely nothing to it. Only the intro which establishes the scant rhythm leading you to think there might be something worthwhile to follow has any real appeal and that only lasts mere seconds before it becomes obvious that there’s nothing of note to follow. In the end – and I feel bad for saying this, knowing it might suggest that Gant was guilty of an elaborate effort to rip you off entirely while laughing at your frustration – Screwy Boogie is so flimsy that it barely has the right to even be called a record. But that’s who Cecil Gant was and nothing was going to change that. Success hadn’t be able to do so, neither would failure. There wasn’t any maliciousness in what he did, but neither was there much appreciation for the interest he’d managed to elicit along the way. He lived a life in which he did merely enough to get by. The record companies he dealt with, and he generally stuck to the same handful who were well aware of his shortcomings and equipped with enough patience to handle it, did what they could with the results but how could they plan for an artist who never had a plan of any kind himself that didn’t involve searching for a bottle of whiskey and a dame to share it with? Bullet Records, his most frequent home at this time, tried to corral him a bit more the next time out by having him revisit a song of his from 1946, a proto-rock cut called My Little Baby, something that wouldn’t be TOO out of place if it had simply been re-issued “as is” in the spring of 1949. The idea to update it for a modern audience was a good one, but in doing so they made the fatal mistake of trying to marry it to a country steel guitar backing to potentially expand his audience and in the process completely ruined the performance. Maybe that just shows what he was suffering from in a professional sense was contagious, for it seems even when someone else had a plan for Cecil Gant it turned out screwy all the same. 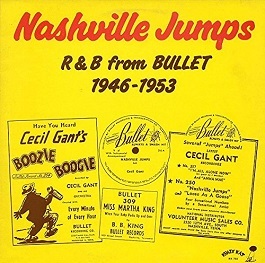 Leave a reply on "Cecil Gant: “Screwy Boogie”"